Banagher bridge 66-Year Championship gap! Banagher players and supporters celebrate winning the Derry Intermediate title at Owenbeg on Saturday. History was made in Owenbeg on Saturday as Banagher won their first senior football title under the club’s current title of St. Mary’s. Banagher captain Paul Cartin receives the Intermediate Championship trophy after St Mary's defeated Ballymaguigan on Saturday. The victory ended a 66-year famine for the club since their last title, won by Feeny in 1952. It was nip and tuck in the early stages with Daniel Bradley and Peter Hagan having a personal battle within the war, Shane Farren missed a first half penalty and only the minimum separated the teams at the break in what had been a nervy and, at times, niggly opening half. In the second half, Mark Lynch began to turn the screw as Banagher took a stranglehold around the middle sector. A monstrous effort from Lynch off his left foot put five between them and at this juncture the men in maroon appeared in control. But Ballymaguigan weren’t going without a fight as Barry McGlone rattled the net in response and suddenly only two separated the teams with nine minutes left. Hagan responded from a free before substitute Ciaran Lynch landed the knockout blow, making an instant impact to rifle the net and confirm Banagher as champions. 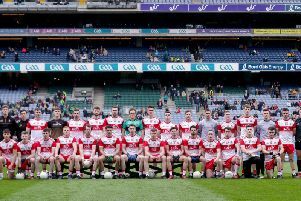 And if the intermediate title was not reward enough, the north Derry side will now represent their club and county on the provincial stage against Fermanagh champions Belnaleck in two week’s time. We had to wait until the fourth minute for the opening score, Thomas Brady shooting over from range. Tiernan Moore levelled but neither side could get far ahead, Daniel Bradley nailing a free before Hagan repeated replied in kind. Bradley continued his dream start, sending a free high between the posts but ‘Quigan claimed the next kick-out and once again it was Bradley who fired over a massive effort from long range. The sides would not be separated for long thanks to another Hagan free while O’Neill was getting a run of the game and profited from a Brian Og McGilligan mark to shoot over from a narrow angle. Ciaran McIvor instinctively picked up a break and deployed Barry McGlone, Conor Feeney’s influence the attacking third continuing to grow and after being fouled, Hagan made no mistake from the free. With the two sides tied once again, Banagher had the chance to strike a hammer blow. Conor Feeney’s initial shot rattled the crossbar before breaking in front of the box. McGilligan burst onto the ball but was fouled by Ciaran McIvor and St. Mary’s had a penalty. Shane Farren stepped up but could only watch as his effort was superbly saved by Aaron Cassidy. A Hagan free proved the final score of the half as Bangher tuned around one point to the good at 0-6 to 0-5. It was the South Derry men who started the second half sharpest, Darren Conway kicking wide before Barry McGlone squandered a goal chance. Eventually the sides were level for the fifth time courtesy of a long range free from McGlone but it was Banagher who kicked on with four scores on the bounce to forge a lead they would never relinquish. First Gavin O’Neill fired over before Mark Lynch put two between them, clipping over from in front of the stand and acknowledging it’s importance with a fist pump in celebration. Lynch continued to take the game by the scruff of the neck, landing a free before shooting over expertly off his left foot to put St. Mary’s well in the ascendancy. However, Quigan weren’t going down without a fight as Daniel Bradley picked out McGlone who duly rattled the back of the net to reduce the deficit to one with still nine minutes left. The Banagher response was immediate and came from one of their key performers, Peter Hagan this time from play as he grabbed his sixth point of the contest. Conor Feeney was still full of energy and drew a foul for Mark Lynch to tap over and suddenly there was three between the sides once again. McGlone grabbed another free to bring the tally back to two but the last punch of the fight would fall to super sub, Ciaran Lynch who took the pass from Mark Lynch before firing into the net to secure the win. Darren Conway sent a late free over but it was too little, too late as Banagher marched on to celebrated their first senior football title as the St. Mary’s Banagher club. St Mary’s Banagher: Darrell McDermott, Shane Murphy, Ruairi McCloskey, Oisin McCloskey, Paul Cartin (c), Sean McCullagh, Darragh McCloskey, Brian Óg McGilligan, Mark Lynch (0-02, 0-02f), Gavin O’Neill (0-01), Peter Hagan (0-02, 0-04f), Conor Feeney, Niall Moore, Shane Farren, Tiarnan Moore (0-01). (Subs) Ciaran Lynch (1-00). St Trea’s Ballymaguigan: Aaron Cassidy, Shea Bradley, Liam Cassidy, Michael Spiers, Paudie Martin, Ryan Ferris, Tomás Brady (0-01), Johnny Crozier, Tomás Kealey, Ciaran McIvor (c), Sean Brady, Fergal Johnston, Barry McGlone (1-01, 0-02f), Darren Conway (0-01f), Daniel Bradley (0-01, 0-02f).